In a statement on his Facebook page, Judd writes: "Today, I turn 31 years old and as a gift to myself, as sad as it makes me to do this, I'm letting go of something that I've put blood, sweat and tears into for the last 13 1/2 years. "It's been an amazing ride full of extreme highs and extreme lows. It's taken me around the world to places I'd never have imagined getting to see / experience. I've toured with some of my favorite bands ever and met some of the most amazing people I could ever have asked to meet. These experiences are fond memories that I will be able to reflect on until the day I die and be eternally grateful for having in my mind. "There are two releases left that are yet to come out: a split 10-inch MLP with THE MANY, which will be released on Plastik Musik in the coming months, and the band's epitaph LP, 'The World We Left Behind', to be released worldwide on CD / LP / digitally by Century Media Records in spring 2014. A vinyl box set of the band's entire discography is also in the works and will hopefully see the light of day sometime in 2014. "Thanks to you fans worldwide who've supported the band over the last 13 1/2 years. You are the people I owe the most to, as you helped me bring a dream of mine since my earliest memories of being alive to be able to be a musician and a live performer come to life. I feel that between the year 1999 and today in late 2013, I've lived more than most people do in a lifetime through my experiences with NACHTMYSTIUM, and every one of you who ever bought a tape, a CD, an LP, a t-shirt, a concert ticket, a poster, a patch, etc., you were the people that truly helped bring this dream of mine to reality. I am eternally grateful to you all for helping make this happen. "Please enjoy the music NACHTMYSTIUM has left behind for all of you for years to come. The band may be gone, but the recordings will live forever and I hope that they will be played by all of you at some point time and time again." 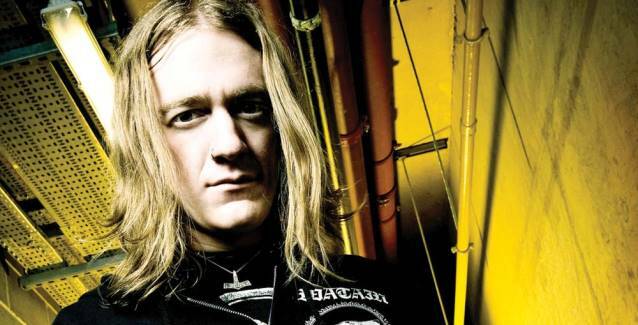 NACHTMYSTIUM's sixth album, "Silencing Machine", was released in July 2012 via Century Media Records.